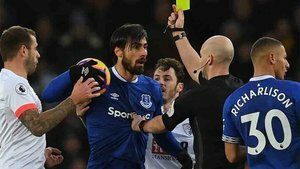 Everton coach Marcos Silva has been tough on Portugal midfielder Andre Gomes, who's on loan at the club from Barcelona, after Saturday's loss to Southampton in the Premier League. Silva has criticised Gomes' performance, who he took off in the game in the second half before singling him out in his post game comments. "It was a difficult game for Andre, although not just for him, for the whole tea," he said. "Of course he didn't like it. He's not happy with his performance, but that's not just him, it's other players as well. "Andre did really, really good things for us, but we didn't see the normal Andre Gomes against Southampton. I am sure that will all change. "It's not about if he's tired or not. We had a normal week to prepare for the game and I didn't see Andre as tired of anything like that, that's not an excuse for us."